I am always intrigued to know peoples’ thought processes as they hear or read the Gospels. How do we process these stories? How do we seek to apply them, particularly on this, a Baptismal Sunday? I’d love to know what everyone is thinking right now in relation to today’s passage. As a general principle I try to imagine my way into Gospel stories. I try to see myself as an anonymous member of the crowd as I try to walk through the story. Who do I most identify with? Who do I sympathise with? Who irritates me? What if I sat here or over by him? What if I couldn’t hear properly because of the crowd? What if I didn’t actually trust this man Jesus? What if I was a Pharisee? I have to do this because I am almost always disappointed by the brevity of the gospel stories and their lack of background detail: they seem so clinical and succinct. I want to know that there was someone there who kept coughing at inopportune moments, or that there were children playing nearby, or that there were cooking smells or that it had just rained. But not this time: today’s Gospel taps into a phobia of mine. I am not at all comfortable on a boat – however big. Some years ago, I travelled from Tallinn in Estonia to Helsinki in Finland by ferry and back again – in the depths of winter with a leaden sky and horizontal snow. It was a memorable journey. I wanted to kiss the ground when I disembarked. As we arrived at the ferry terminal I was immediately horrified by our ferry: it looked like a tug. It fought with the ice for most of the journey so violently and my travel companions and I couldn’t escape to the outer decks to nurse our misery because of the intense cold – colder than I have ever been before or since. We finally found a place in the bar but we didn’t think drinking would be too clever, but we did note upon arrival back in Tallinn that there were many who had decided on that refuge to the extent that they were so drunk the crew couldn’t tell whether they were Estonians or Finns. So we sat there in the most surreal of settings imaginable, pale green with sea-sickness while half a dozen couples - seasoned veterans clearly - spent the evening dancing exhibition Latin American and ballroom to a live five piece band - including (I kid you not) the theme to “Titanic”. So strong is that image at a time when I firmly believed I was going to die that I fully expected my journey into resurrection to be accompanied by a woman wearing red sequins and dancing a rumba! Fear is the word that comes to mind: fear of circumstances being beyond our control, fear of the ice, of the cold and fear that death could be just a moment away. Such is the fear, I’m sure that the disciples in the boat felt when they were “battered by the waves” on Lake Galilee one evening as they waited for Jesus to finish his private prayers. I can hardly imagine someone walking on a sea when it is calm, much less when the waves are rolling and the wind is whipping the surface of the sea. Yet Jesus comes along, not reassuring the disciples by his arrival but initially adding to their fear. Their first reaction is that he must be a “Ghost”. Jesus’ unrecognized presence on the sea was a threat to the disciples. So, in order to calm their fears, Jesus identifies himself, but the real test for that early morning, was whether they could trust his four-fold word to them, “Take heart; have no fear; it is I;” and then to Peter, “come”. These words might just seem like a quick reassurance but they are full of resonance and meaning and we must imagine them being delivered with great authority. “Take heart,” recalls Moses’ words to the Israelites on the edge of the Red Sea with the pursuing Egyptians right behind them. “Take heart; do not be afraid, stand firm and see the deliverance that the Lord will accomplish for you today.” says Moses. And “do not be afraid” runs through the Gospel narratives spoken by God’s messengers to Joseph and Mary, by Jesus to Peter, John, and James on the mount of the Transfiguration, by God’s messenger to the women at the tomb and by Jesus as he sends the disciples into the mission field. Finally, “it is I,” that takes us back to the burning bush and God’s thundering, “I am who I am,” and all the “I am” statements of Jesus in John’s Gospel. When Jesus says, “Come,” Peter has to respond. In this respect we have to see Peter here as a template for Christians down the ages and therefore for Kyara and Luke - and that for me is the key point: we are faced with how we interpret Jesus’ words in any given Gospel passage whether we read it or hear it. We need to be clear who Jesus is talking to. Well, we see Jesus here talking to Peter and if we, all this time later, consider ourselves also to be disciples then this passage is most certainly for us to hear - and to act upon. The Gospel passages have to have the power to challenge us and to change or they will remain marginally interesting pieces of religious literature, nothing more. So, in whatever situation we find ourselves, when Jesus says “Come!” we’re faced with the same choice as Peter was and today as Wayne and Kelly and Emma and Paul are for their children. When Peter steps out of the boat, the reader and Peter are given the startling truth that this indeed is the one who commands the waves. This is the “I AM” who revealed himself to Moses and who has intervened with saving power so many times in the history of Israel that we should pay attention now. This changes everything in terms of how we now see ourselves in this story. In Jesus, the great “I AM” has come to dwell with us and for us, whether we are tossed about on the seas or hungry on the hillside, whether we are in the boat or out of the boat. The point of this presence is not to show us that God has supernatural powers so much as to give us calm in the midst of our stormy world to imagine that we too might wade out into the storm with God’s help. 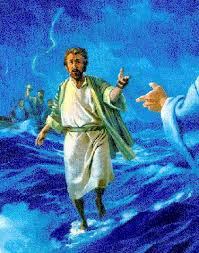 In fact, like Peter, when we recognize God present in our world, we are commanded to go out into the water, knowing that in the storms of this life Jesus is with us. It is hard, isn’t it, to imagine ourselves in such a set of circumstances as Peter however we might seek to put a personal gloss on what “the storm” might be interpreted to mean in our own lives when we are in the midst of our own discomfort and we call on Jesus for help: work; study; relationships; personal crises of faith; frustration with the culture and politics of our time; our own sense of our Christian calling – whatever destabilises us and distresses us. And as we consider ourselves, let’s not forget those whose personal storm is to be driven from their homes with the threat of death hanging over them for being identified as disciples – in Iraq and Syria, in Southern Sudan and Northern Nigeria. What can this passage mean to them? Is there any way that we can respond to Jesus on their behalf when he calls “Come!” rather than concentrating on our own woes, given the contrast in their traumas to those of our own? We also know that when Peter’s attention returned to the wind and the water, he began to sink and then, as if it had not already been so, his only hope was Jesus. The final good news in this passage comes as Peter falters and starts to sink. We too will surely falter. We too will feel that we are drowning in the depths of our world’s darkness. We too will surely feel that the chaotic waters of life are too treacherous for our tentative footsteps. We too will sink. That is real. That’s life. Only fools pretend otherwise. This isn’t, as some Christians might imply, a story of Jesus as the magic talisman, protecting us from all dangers. No. This is Jesus who enables us to cope in those dangers. And see as Peter does - and as Luke and Kyara hopefully will - that Jesus’ hand reaches out to us. We also discover that our doubts and fears, while the cause for a rebuke from our Lord, do not, in fact, take us outside of his care and concern. It is my prayer that we will look not to our own feelings for a way out of the problems that we face as individuals and as a church, but rather look to the one who walks calmly in the midst of our storms, our anxieties and our personal and institutional controversies. When, surrounded by the moving waves, we falter, will we too grasp Jesus steady hand? Or will he huddle in the safe and comfortable boxes and routines we have established for ourselves as our inadequate coping strategies to fend off the outside world? The choice is ever before us! The great “I AM” continues to walk out in the chaotic waters of the world. How will we answer when he bids us, “Come!”?